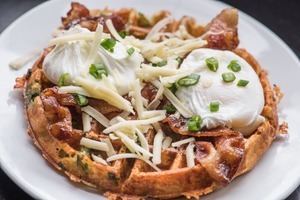 The savory waffle with bacon and eggs from Soul Delicious. Photo courtesy of Soul Delicious. Starting Saturday June 13th, catch new brunch pop-up Soul Delicious at The Lookout from 11am to 4pm. The pop-up is a partnership between Wes Rowe of Wes Burger, Dominique Garcia of Mama, and the Motown on Monday DJs. The two chefs will alternate cooking soul food each week, with Rowe kicking it off on the 13th. The first menu includes Rowe’s famed Uncle Brother’s fried chicken with cheese grits cakes and jalapeño cream gravy, sweet or savory waffles, and Austin-style breakfast tacos. Take a look at the whole menu right here, and let the hunger pangs begin. 3600 16th St. at Market, 415-431-0306.